A group of children and their parents went to a local park to go sledding. All of the kids had experience sledding, and they had all sledded this particular hill many times before. One of the young girls decided to copy another group of children and rode her sled backwards. As she was riding backwards down the hill she veered off course and collided with a few trees near the hill. She struck a tree with the back of her head and was instantly knocked unconscious. After attempts to wake her failed she was taken to a local hospital where she later died due to severe head trauma. Every year, after the first snow fall, children grab their sleds and head to the nearest hill for some sledding. Sledding is a fun winter activity, but sledding also poses some major hazards. The Consumer Product Safety Commission (CPSC) recently conducted a study highlighting the amount of property damage and personal injury sledding causes every year in the United States. Is the sledding area away from roads? Is there plenty of room to stop safely? Is there a safe area to climb back up the hill? Is the area free from hazards like trees, playground equipment, or anything else someone could collide with? Are all immovable hazards, like trees, surrounded by protective barriers like hay bales? Are there ponds or rivers nearby that may not be completely frozen? Is the area secure and safe? Property owners of sledding hills need to take several precautions to protect themselves from lawsuits and other damages. It is best to not open hills to the general public. Keeping sledders out can be difficult, however, so it is important to post signs detailing sledding rules for the hill if it is opened to the public. Ideally, all sledders should sign excuplatory agreements that effectively wiave all liability. Waivers can be extremely difficult to obtain, but they are absolutely the best way to protect against lawsuits and claims of negligence. Children should be supervised at all times, but it is important to pay extra attention when they are engaged in a potentially dangerous activity like sledding. 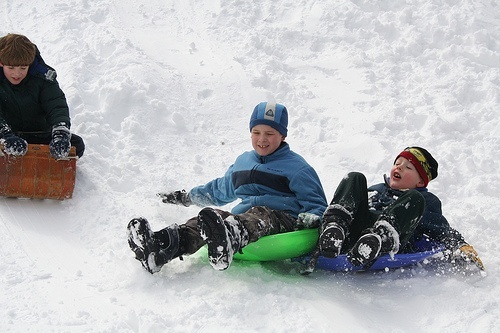 A study by the American Association of Orthopedic Surgeons reported that 71% of all sledding injuries occurred without adult supervision and the incident rate drops significantly when there is adult supervision. Supervising adults should make sure all participants are sledding safely and not engaging in any unnecessarily risky behavior. Make sure all equipment used for sledding is safe and in good working condition. Sleds that are cracked, broken, or damaged in any way should be discarded as they could pose a danger to the user and others. Also, the use of anything other than a device designed specifically for sledding should be prohibited. Garbage can lids, lunch trays, tarps, or anything else that could be used as a sled should not be permitted. These items are not designed to be ridden as a sled and could be dangerous. Children sledding should also wear appropriate clothing for the temperature. Helmets are 85% effective in preventing brain injuries and should be worn by all children who sled, especially those under 12 years of age. Sleds going down steep hills can travel at speeds in excess of 20-25 mph and if a rider is thrown from the sled or crashes into an object, the damage could be extensive and even fatal. 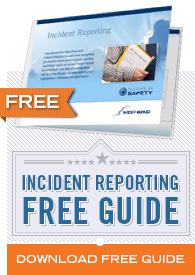 Every year there are deaths as a result of brain injuries suffered from sled accidents. Wearing a helmet while sledding can greatly reduce these injuries. By always sledding seated and in a forward-facing position, participants will be in the most control of their sled. The forward-facing position allows sledders to be in the best position to view potential hazards and steer their sled or bail out if necessary. Positions to be discouraged are facing backwards, on the stomach, or anything else that would limit sled control. It is important that all sled riders are aware of how their particular sled is meant to be ridden and what the designed rider load is. Putting more people on a sled than it was designed for could be dangerous to all riders and other sledders if the overloaded sled goes off course. Sleds should always be used in the way they were designed and it is up to the supervisors to make sure children use them properly.